Bank of Baroda Specialist Officers 2018 recruitment: 913 Specialist Officers Posts @ Bank of Baroda: Bank of Baroda has published employment notification for the recruitment of Specialist Officer/SO vacancies. 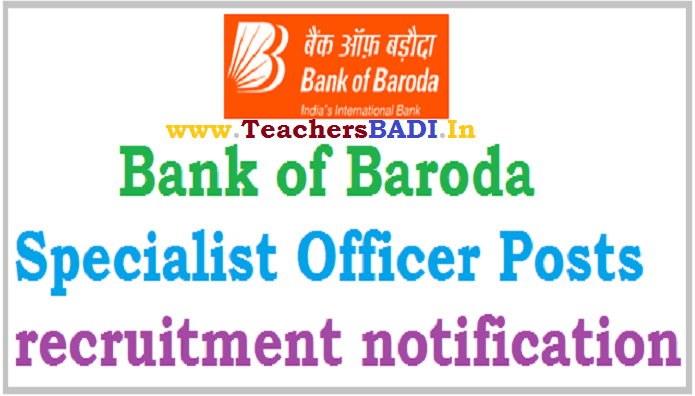 Bank of Baroda invites application for the recruitment of Specialist Officer Posts. bank of baroda specialist officer posts 2018 recruitment notification,online application form,last date for apply online, results, hall tickets, how to apply, selection list, bank of baroda specialist officer posts more details IBPS portal/Bank Of India website. Selection Procedure: Based on online written test, psychometric test/ group discussion, Interview. Any Degree, PG (relevant disciplines), MS/ Ph.D. with post-qualification experience. CA/ ICWA/ MBA/ PGDM/ PG Degree/ Diploma. Candidates may apply online through Bank website. Last date for Online Registration of Application: 26.12.2018. Legal: A Bachelor Degree in Law. Wealth Management Services - Sales (MMG/S-II): 2 Year (MBA or equivalent) Post Graduation Degree or Diploma with specialization in Marketing / Sales / Retail. (The Institute should be approved by Govt / Govt Bodies / AICTE) OR Graduation (recognized/approved by Govt., Govt. bodies / AICTE) with One-year Diploma/ Certification in Banking / Finance before joining any private Bank/ Public Bank. Wealth Management Services - Sales (JMG/S-I): Graduation in any stream (recognized/approved by Govt., Govt. bodies / AICTE). Wealth Management Services - Operations (MMG/S-II): 2 Year (MBA or equivalent) Post Graduation Degree or Diploma with specialization in Marketing / Sales / Retail / Finance. (The Institute should be approved by Govt / Govt Bodies / AICTE). The selection process will comprise of online test, for the post of Scale I, in the discipline of Sales, followed by GD/Interview of the shortlisted candidates. For the posts in Scale II, Scale III, Scale IV & Scale V applications will be shortlisted and candidates will then be called for GD/interview. However, for Scale II and Scale III, if the number of eligible applications received is large, then Bank reserves the right to hold an online test also. Bank may, at its discretion, consider conducting of Psychometric Test / Group Discussion for different scales. The above tests except the Test of English Language will be available bilingually, i.e. English and Hindi. Bank reserves the right to modify the structure of the examination which will be intimated through its website. Other detailed information regarding the examination will be given in an information Handout, which will be made available for the candidates to download along with the call letters from the Bank’s official website. The admit card for Specialist Officer (SO) has been released by The Bank Of Baroda. The Specialist Officer exam is conducted to fill 361 posts. The SO examination to be held on as per its schedule. Candidates can download their respective admit card from the official website. How to download Bank of Baroda SO admit card? In order to download Admit Card, the candidates who have applied for the above-mentioned vacancies must have to open the official website of Bank of Baroda. Step 1: Open the Home page, the candidates have to open Careers section. Step 2: In Careers section, the candidates have to open Current Opportunities section. Step 3: After opening the Current Opportunities section, the candidates have to open the link for downloading Call Letter for Recruitment of Specialist Officers Project 2018-18. Step 4: Opening the above-mentioned link, the candidates have to enter their Registration No/ Roll No along with Password/ Date of Birth and Captcha then click on Login button to open the Admit Card. Step 5: The candidates may save their Admit Card for future references.